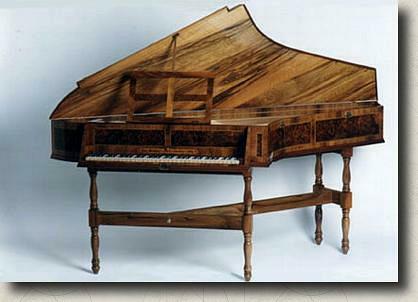 The bentside spinet is of the kind made in large numbers in the 18th century, both in England and on the continent. It is available in two forms: either with an angled tail, as was more common, or with a double bentside giving a rounded tail. The compass is around 5 octaves and the keyboard is transposable. It is elaborately veneered by hand, typically in mahogany or walnut, and has a trestle stand with turned legs. The design is not copied from any particular surviving instrument, but its proportions are typical of many instruments of the period.